“Coldhearted” is an episode perfect for anyone who may want to delve in to YJ but doesn’t want to wade through a lot of backstory (and will then get hooked nonetheless). As the episode dawns, it’s Kid Flash’s (Jason Spisak) 16th birthday, and the hero otherwise known as Wally West is looking forward to everything a 16-year-old would look forward to: giant breakfast, not-so-surprise party with his friends, a chance to get a birthday kiss from his unrequited crush, Miss Martian. Unfortunately, his birthday plans soon falter, as he learns that Miss Martian is going out with Superboy, and he will miss the very first Young Justice/Justice League team-up because he has to deliver a heart to a transplant victim cross-country. 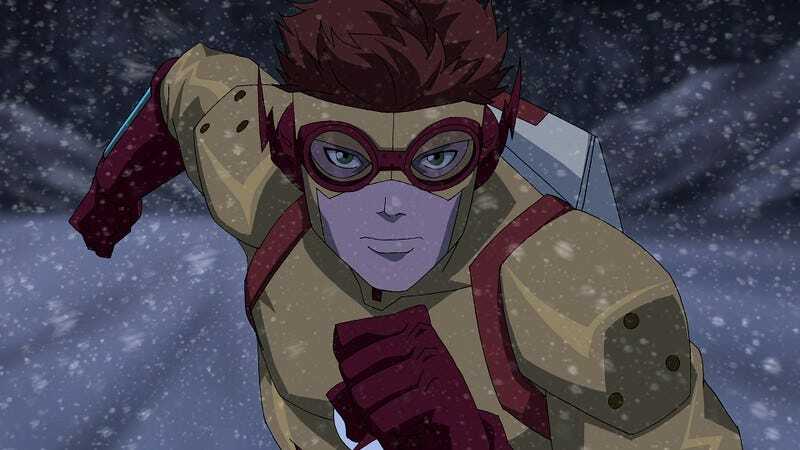 Even more than Robin, Wally is the wiseacre of Young Justice, and this Kid Flash-focused episode lets us see another side of him. Young Justice could occasionally get bogged down in a multitude of heroes and missions, but here we only see the team-up on computer and TV screens. The focus is on Wally, and the practical details of his mission for traveling from point A to point B. He has to get the heart to the patient in a certain time period. He also has a problem with hunger, as running that quickly burns vast amounts of calories, even more so for a teenage boy. And unsurprisingly, various villains throw obstacles in the way of his journey. The battles Wally faces as a super-speedster are always entertaining, as is his often-hilarious cheeky dialogue. He’s obviously disappointed at being left out of the adult adventure, as any kid would be. But the ruse he comes up with to complete his mission is twisty enough to be completely satisfying, as is his grown-up realization about the importance of everything he does, even what at first appears to be the tiniest of tasks. By the end of the episode, even the team’s jokester has gained a whole new level of maturity. Availability: “Coldhearted,” along with the rest of Young Justice season one, is streaming on Netflix.